Solar startup 1366 Technologies has closed $5.15 million in a second round of funding from North Bridge Venture Partners and Polaris Venture Partners and plans to announce the funding this morning. Xconomy first reported the story yesterday, and according to a Securities and Exchange Commission filing yesterday, the cash is part of a round expected to total $6.2 million. The new cash comes after 1366 raised $4 million from the U.S. Department of Energy’s Advanced Research Projects Agency-Energy (ARPA-E) program, becoming the first (and so far, the only) photovoltaic startup to be selected. The MIT spinoff, founded in 2007, also previously raised $12.4 million back in March. 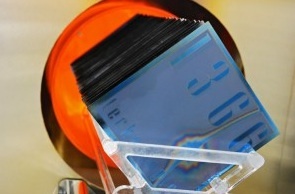 1366 is developing technologies to boost the efficiency – and lower the cost – of manufacturing conventional multicrystalline solar cells, starting with two machines: one that “texturizes” solar cells, giving them a surface texture that increases internal light refraction and boosts solar panel efficiency, and another that produces thinner conductive metal “fingers” on the cells, which cut costs and reduce shading, again increasing efficiency. Craig Lund, director of business development for the Lexington, Mass.-based company, tells us the company is about to sign on its third customer for testing these tools and plans to install them in its customers’ pilot lines in the first half of next year. The company has signed confidentiality agreements and can’t yet disclose the names of its customers, Lund said, adding that all three are based in Europe. The company last year had expected to deliver a machine for its first customer this March. In September, chief technology officer Emanuel Sachs said 1366’s technologies have already produced cells of almost 18 percent efficiency, and the company expects to hit 19 percent this year, at a cost only pennies per watt more than that of producing cells with 16 percent efficiency. Standard multicrystalline cells average approximately 16 percent efficiency, although the most efficient multicrysalline cells, such as those made by Kyocera, already have exceeded 18 percent efficiency. With its ARPA-E money, 1366 also is researching a new way of making wafers by molding them directly from molten silicon, cutting out many steps in order to potentially cut costs by 70 percent, reduce silicon waste by 50 percent and further boost panel efficiencies to up to 20 percent, Lund said. Such low costs could make it more feasible to produce wafers in the United States instead of in China, especially if the U.S. market takes off, he added. If the technology works as 1366 hopes, the company plans to manufacture wafers – instead of supplying equipment as it is with its other technologies – and sell them to solar-cell manufacturers, the same customers that it’s targeting with its first machines. It hopes to have a factory up and running by 2012, Lund said, adding that the company is hoping to help fund the manufacturing facility with a federal loan. 1366 also is hiring, Lund said. The company has grown from 12 to 26 employees and expects to reach 30 employees by next month, he said.